Prince FAB isa hidden gem we found on Sampige Road in Malleswaram. Because these guys specialise in offering all things denim, but on a budget. Be it denim dresses, shirts, or even sleeveless vests, along with jeans, Prince FAB has it all, and everything is under INR 500! If you are like us, you are one of those who is always on the lookout for a pair of good jeans or even a nice retro denim skirt. And when we came across Prince FAB amidst the hustle and bustle of Sampige Road, we were overjoyed. 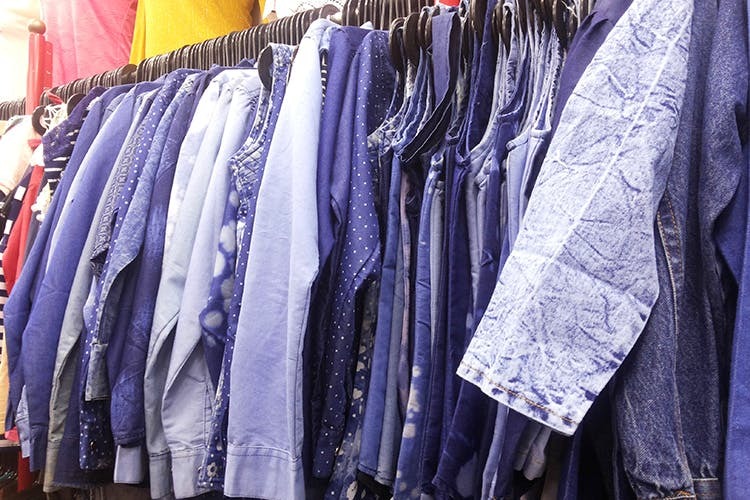 because this store stocks all possible kinds of denim apparel and also in different washes and shades — from light faded blue ones to deep navy blue. We have even spotted very trendy high waisted jeans here. Though most of the inventory in this store will cost you only INR 500, some items might go up a bit. We also spotted casual denim shirts, sleeveless denim vests, and knee length chambray dresses. Some of the styles also come in softer denim fabrics with prints, polka dots and acid washes on them. And you can even choose a shade to your liking, once you zero in on your choice of a shirt or dress. Ladies, this store also stocks most regular sizes.